But I’ve heard some variation of this theme tent staked into the ground by the army of talking heads at the four-letter for the last week or so, and I just can’t stand it anymore. On no planet, especially this one, is Eli Manning a better quarterback than his older brother, Peyton. I don’t care if Eli’s Giants win the Super Bowl on Sunday – giving Eli ring No. 2. It still won’t make any difference. How quickly we as sports fans forget that which we can’t see. Peyton Manning hasn’t thrown a meaningful pass since the 2010 playoffs, and people start forgetting what a transcendent talent he is. Pick a stat and have a look. Touchdowns? Peyton. Completion percentage? Peyton. On and on, kids. On and on. Now, I’ve heard the ring debate before. Trent Dilfer has a ring and Dan Marino doesn’t. Is there really any debate about which player was better? Football is a team game, and contrary to popular opinion, quarterbacks rarely win or lose games all by themselves. 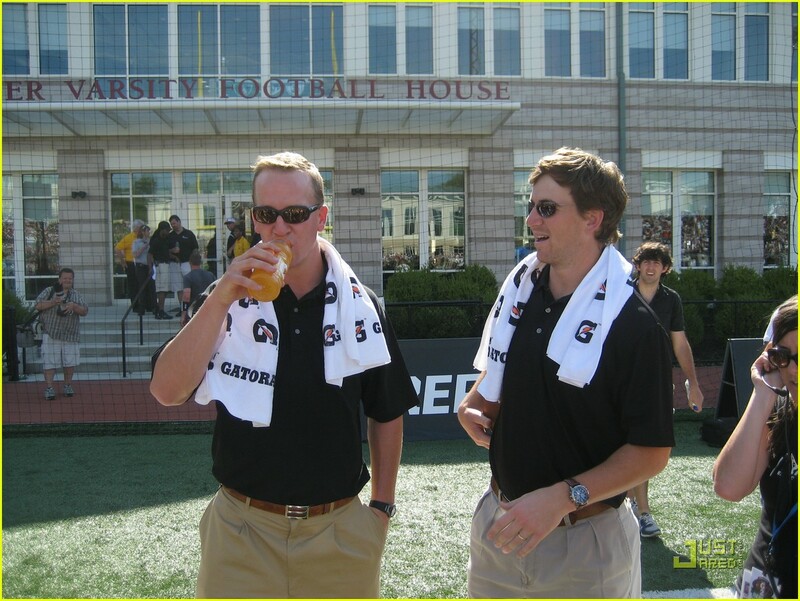 I love Eli Manning, and I think he’s really raised his game in recent years. But just because Peyton’s NFL appearances are limited to his array of ads on TV, let’s not forget that he’s in the discussion of being the best ever. So, one would think he has best in the family locked up. Above is a picture of the most analyzed man on the face of the earth. 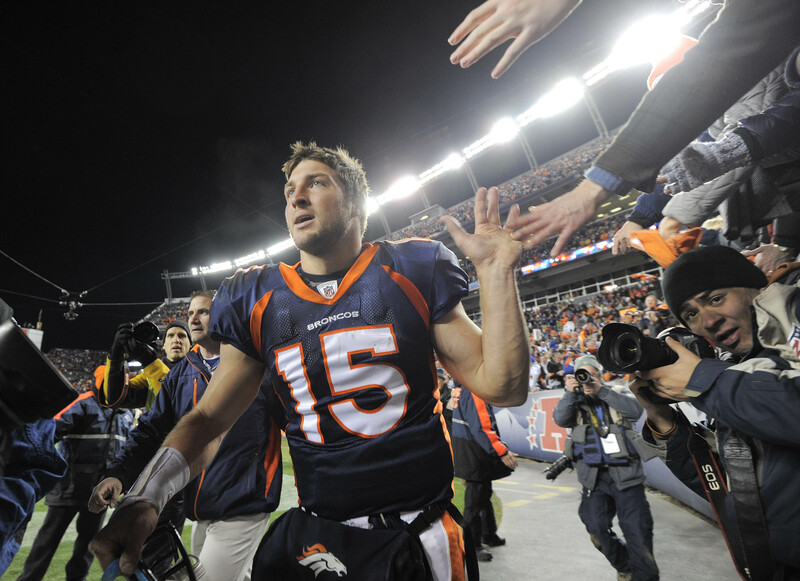 Denver quarterback Tim Tebow has two things going for him which contribute to the enormous amount of media scrutiny he’s getting. He’s an NFL quarterback, and he’s a Christian. Just being a quarterback is enough to get you married to a model (Tom Brady) or splashed on magazine covers like one (Mark Sanchez). But, when that quarterback is a Christian – and not in a quiet, only if you really ask him about it sort of way – we end up with a guy under the biggest sports microscope I’ve ever seen. The beautiful thing about America is freedom of choice, or more simply put, the ability to believe whatever you choose. So, you’re allowed to believe that he’s the luckiest man alive. You can think that the fact he threw for 316 yards against the Steelers in last weekend’s playoff win is a coincidence if you want. You can call it blind luck that three defensive starters for Pittsburgh either didn’t start (Ryan Clark) or got hurt early on (Casey Hampton and Brett Keisel). You can point to Ben Roethlisberger’s injured ankle and say it was a – pardon the pun – lucky break for the Broncos. You can go back to the way Denver backed into the playoffs or the unlikely wins over Miami and Chicago that made it possible and chalk it up to good fortune. You can look at the funky throwing motion, the bounced passes and the game tape from the Buffalo debacle a few weeks back and decide that he’s never going to make it long term in the National Football League. Or, you can believe what Tebow himself believes. Which is that God has a plan for everyone. You can think that good things happen to good people. You can smile as sings spiritual songs on the sidelines and be proud of the fact that he’s not out womanizing, taunting or otherwise making a menace to society out of himself. You can view him as a breath of fresh air for a league sometimes lacking in feel good stories. That is also a choice. Me? I feel the same way about this story as I would if I were covering him. I like it because it’s interesting. I used to sit in press boxes in the third quarter of a blowout just praying for something good to happen. “I need two more paragraphs,” I’d say to anyone within earshot. Of course, as a Christian, I personally tend to lean a bit towards the second theory. But there’s one thing I know for sure. If my son liked sports at all, there would be a Tim Tebow poster on his wall. Because if there’s someone out there worth emulating, it’s that guy. Have you ever passed by an awful wreck on the highway, one with cars mangled, metal twisted and the flashing lights of emergency workers drawing attention from a mile away? You have to look at it, right? That was me in the third quarter of last night’s 70-33 beatdown of Clemson by West Virginia in the Orange Bowl. No one would have blamed me for turning off the TV and going to bed. I even picked up the remote once or twice and aimed it at the screen. I just couldn’t turn away. It was so horrific and awful as a Tiger fan that I had to sit there and soak in the shame of it all. Being a big picture guy, I’d still like to classify this season as a success. The team won 10 games and a league title, after all. That’s not a score, that’s a statement. I’m not a fire the coach guy, but we need a lamb on the altar for that game last night. I would like to take a moment and thank my coworkers and Facebook friends for taking it easy on me this morning. One can handle only so much abuse. Yeah, but at least the Confederacy put up a fight. So, I went to sleep last night a bitter, enraged Clemson fan. I woke up very much the same way. But I tip my cap to West Virginia for a top-notch performance. And no, I don’t care that they were running up the score. It’s their job to score. It’s our job to stop them. That’s defense, or at least, it should be.